Falling Skies premiered last summer and while it was executive produced by Steven Spielberg it didn’t receive half the fanfare and hoopla that Spielberg’s other TV offering Terra Nova did. 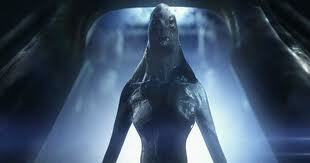 But Falling Skies did one thing that the other sci-fi show couldn’t, it survived. 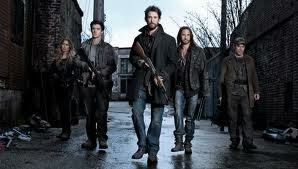 This week, TNT premiered the second season of Falling Skies and it picked up where it last left viewers. At the end of the first season, the show’s protagonist, a history teacher turned freedom fighter, Tom Mason (Noah Wyle) allowed himself to be taken captive by the alien invaders that have conquered the world. The second season premiere episode of Falling Skies (actually two episodes “Worlds Apart” and “Shall We Gather At The River”) takes place three months later in Boston and the Massachusetts countryside. Mason’s group led by the hard-bitten but sympathetic Captain Weaver (Will Patton) are engaging in harassing attacks against the alien skitters (vaguely resembling giant arachnids) and the robotics mechs. During one ambush, Mason’s two sons Hal (Drew Roy) and Ben (Connor Jessup), who was previously enslaved by the aliens, discover a wounded Mason in the melee. Flashbacks reveal what happened to Tom Mason in the missing time. On board the aliens’ ship Mason is told that his group will be given sanctuary if they stop fighting. He refuses the offerand attacks the aliens’ bipedal overlord. Next thing he knows, he is released along with other military prisoners who are then executed; strangely he is able to escape. Eventually he reunites with the group but he no longer trusts himself. Convinced he has been turned into some kind of sleeper agent, Mason has himself restrained after a parasitic lifeform is found in his eye. The scenes where the group’s doctor, Anne Glass (Moon Bloodgood) removes the wiggling, worm-like creature were truly cringe inducing. By the time, Tom Mason has reunited with his friends, it’s obvious that this rag-tag group is very desperate and depleted. Over a hundred people have been killed since Mason’s capture and they are low on supplies. These two episodes do a great job of showing how beaten down these fighters are and yet they keep on fighting. At this point, their primary objective isn’t to overthrow the aliens. They are simply outmatched. Rather their only goal is survival. The production design is excellent, everyone looks believably grungy and their equipment looks worn and well used. And the second season has ramped up the action and the tension. As one of the few genuine science fiction shows on the air right now, Falling Skies is a well-produced effort and it seems as if the show has found its legs and will hopefully continue to grow. 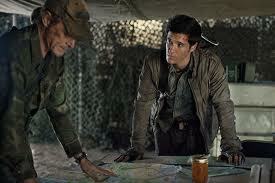 Unlike other genre shows, it’s fairly easy to jump into Falling Skies and watch the interesting story unfold.